No matter the age, shoulder injuries plague baseball players. At their least severe, they hinder performance and drive young players from playing the game. In worse cases, they can lead to surgeries and months on the shelf. Taking care of the shoulder can lead to a long, healthy season and proper long-term velocity development. 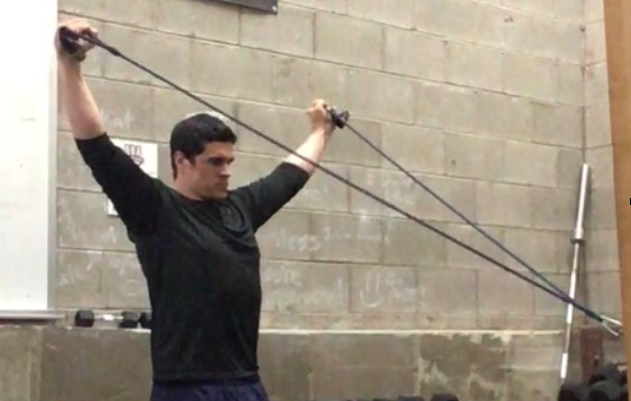 Some tips I have for the development of a good shoulder care plan include a proper warm-up, monitoring the number of throws, and the use of band exercises. -Structure practices so that positional players will not exceed 20 throws from their position. Focus on footwork and mechanical practice to help limit throws. -Make sure that pitchers are limited on a strict count in their bullpen work. Focus on mechanical drills to ensure that each throw is at the peak of the pitcher's performance. -Limit long toss before games. Once or twice a week is fine, but long tossing every day can lead to far too much stress on the arm over a two month period. -T's or Shoulder Fly's: Start with the hands together and separate horizontally. -Y's: Start with the hands together and separate vertically on a 45 degree angle (think of the "Y" in the YMCA dance). -I's: Start with your hands together, raise them vertically straight up overhead. -Shoulder Press: Start with your hands at your shoulders and press straight up overhead. -Internal/External Rotation: Start with one hand over your chest, elbow down along your rib cage, slowly rotate the hand outward. Turn around and reverse the movement (pulling the hand inward toward the chest). -Bow & Arrow: Start with one hand in front of your head, elbow high, pinch back and externally rotate your hand back as if you were pulling an arrow back before being shot. It is very common for baseball players to come across arm soreness. Ignoring arm soreness can lead to serious problems that can end baseball careers at a young age. Be mindful of how the shoulder is used and build good habits to keep young arms healthy! Head Strength & Conditioning coach at Dream Big Athletics.